Yarmouth police Sgt. Sean Gannon was killed serving a warrant in Barnstable last month. Two other officers backed Gannon up on the call. Numerous others responded after Gannon was shot. As the media noise fades, the radio calls from that day can still whisper like a ghost in the deafening silence that remains for the officers involved. Yarmouth Police Chief Frank Frederickson said it in an almost offhand way. "That’s my son. That’s on Barnstable police," he said. "He was there. That’s another piece of the story." 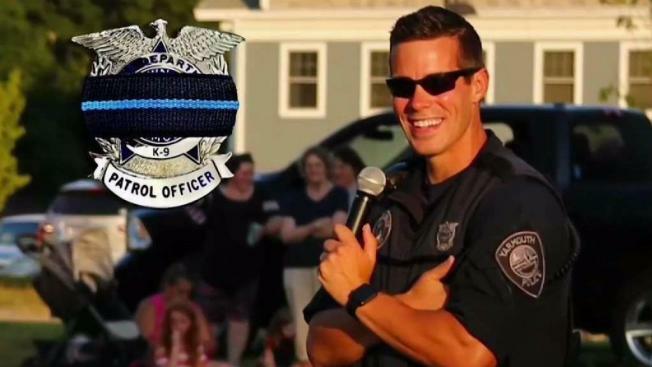 Officer Corey Frederickson, a patrolman with the Barnstable Police Department, responded to reports of shots fired and an officer down on Blueberry Lane on April 12. As the police chief in neighboring Yarmouth, his father heard the call, too. Yarmouth police Sgt. Sean Gannon was killed serving a warrant in Barnstable last month. 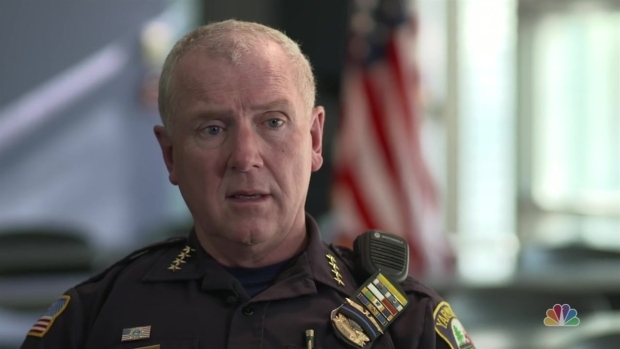 Yarmouth Police Chief Frank Frederickson sits down with NBC10 Boston's Karen Hensel to discuss Sgt. Gannon's tragic death and the traumatic aftermath for the police department. "Oh my God, there were a lot of things going through my mind," Chief Frederickson said. The tragedy of that call on April 12 has reverberated through the two neighboring departments. Yarmouth police Sgt. Sean Gannon was killed serving a warrant in Barnstable. Two other officers backed Gannon up on the call. Numerous others responded after Gannon was shot. As the media noise fades, the radio calls from that day can still whisper like a ghost in the deafening silence that remains for the officers involved. The calm and professional police radio traffic belied the danger of the unfolding situation. "Officer down," said one radio report. "Gunshot wound to an officer," said another. "You realize your brother has been shot," Chief Frederickson said. "You not only have to defend yourself, but render care for your brother." 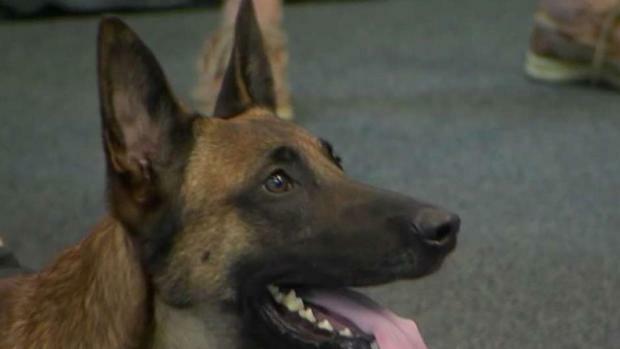 The officers who accompanied Gannon into the house and up to the attic space where he and his K9 partner, Nero, were shot had no idea where the shooter was. And per their training and department policy, they could not return fire. "(It’s) complicated, not knowing where the suspect actually is. So put yourself in that dilemma," Frederickson said. The officers pulled Gannon from the house, but had to leave Nero in the attic. Gannon was rushed to Cape Cod Hospital, but died shortly after. "The dog was at the scene and had to be left there because they were rescuing Officer Gannon," Frederickson said. "There was an attempt to retrieve him, but it couldn’t be done." 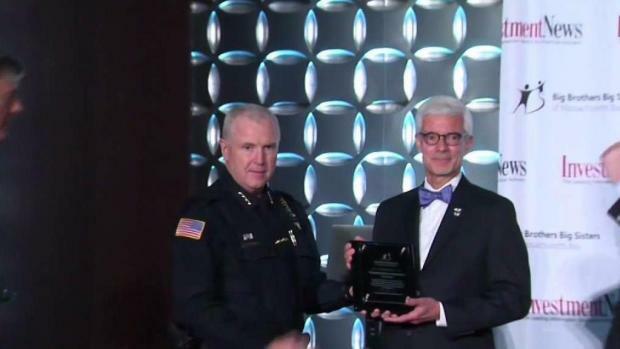 Yarmouth's police chief accepted an award on behalf of late Sgt. Sean Gannon. Three hours would pass before they could rescue Nero and take the suspect, Thomas Latanowich, into custody. A peer support officer typically meets with officers who survive traumatic encounters within eight hours. Within 72 hours, or after the funeral, there is a formal debriefing. "We want to make sure they’re OK. We know this is going to be hard for them,” Frederickson said. "That’s a case where immediately we want them with a peer supporter." Frederickson appreciates the role peer supporters play. His son is a peer supporter for Barnstable. "Everybody wants to help each other. We’re police officers. We help everybody," he said. But getting help for the officers is not always easy. "And that’s just it," he said. "So we’ve instituted a culture we’re supposed to help each other." But many officers in other departments may hesitate to ask for help. "With cops, if we come forward, we lose our gun, we lose our job," said retired Boston Police Sgt. Brian Fleming, who runs the peer support program for the Massachusetts Association of Coalition of Police. "We’re perceived as being weak." Fleming has dedicated himself to opening paths for police to ask for help and get treatment. "We need cops to be able to go get help without any fear of reprisal," he said. At the State House, a bill that would allow officers to ask for help confidentially is stuck in committee for a third year in a row. "Well, it’s an interesting state, because we shouldn’t have to even go there. But we have to get some legislation that will help promote officers to get help," Frederickson said. The Yarmouth chief said his officers who responded to the shooting that day are doing "fairly well." "We’re going to give them all the time they need to get better," he said. Officers are now helping each other when silence replaces the chaos. "Even in policing, you never really see the impact of what one loss of a police officer does to a department - to a community that depends on them,” Frederickson said. When asked how he is doing, the chief said he's doing OK.
"I’m doing my job," he said. "I have a good support mechanism, talking to my peers, who have been extremely helpful."